Prime Minister Stephen Harper has travelled to Davos, Switzerland to attend the World Economic Forum, where world leaders will brainstorm the best way to combat the current financial challenges facing the global economy. Harper will spend the next day and a half in Davos, where he will mingle with business executives, other world leaders and academics at the annual agenda-setting conference. While the forum will see leaders debate a number of topics — including disaster aid in the aftermath of the devastating earthquake in Haiti — the focus clearly remains on the global economy, at a time when employment remains high and governments are becoming less inclined to bail out troubled banks and industries. In a statement released Tuesday, Harper said his government will stick to its stimulus plan and will continue to fight forms of trade protectionism, as it previously committed to doing. On Thursday, the prime minister will address the forum and reveal his agendas for the upcoming G8 conference in Huntsville, Ont., and the G20 conference in Toronto. In his Tuesday statement, Harper said he will push to improve the health of women and children at the G8 summit — a cause he believes is of increased importance in the aftermath of the global recession. Citing statistics that suggest a half-million women die during pregnancy or childbirth each year, Harper said there is a “pressing need” for action, especially when such mortality can be avoided through better nutrition and medical treatment. “This is simply not acceptable. The United Nations had hoped to reduce the number of deaths related to pregnancy by 75 per cent by 2015 as part of its Millennium Development Goals. 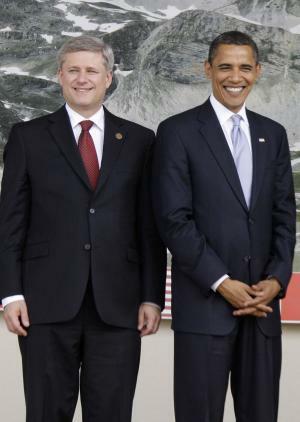 It now appears this target will go unfulfilled,” Harper said. As for the G20 summit, Harper plans to highlight the need for member countries to reform their banking systems in harmony and to continue with stimulus until worldwide labour markets have fully recovered from the global financial crisis. Toronto is poised to have one of the fastest-growing city economies in 2010, says a new study from the Conference Board of Canada. In a report released Wednesday, the private think tank projected 3.5 per cent growth in Toronto’s economy, mainly led by a rebound in construction and manufacturing. “Manufacturing output is expected to increase in Toronto this year for the first time since 2005,” it said in a news release. Of the major Canadian cities, only Vancouver is poised to grow faster, with 4.5 per cent growth projected. The main driving factor there is the 2010 Winter Olympics, which begin on Feb. 8. But consumer spending and housing construction are also expected to be strong. Vancouver’s economy had declined by 1.8 per cent in 2009. However, Kitchener is predicted to have the third-highest growth, with 3.3 per cent expansion. Better manufacturing prospects are being credited. The good news in Ontario extends to other cities hard-hit by the recession and longer-term manufacturing woes. Oshawa is predicted to have 3.2 per cent growth in 2010. “After two years of declining GDP, Oshawa’s economy will benefit from the worldwide recovery now underway, especially in its key auto manufacturing industry. Housing starts are expected to double from 2009 levels, which will boost the construction sector,” it said. Hamilton has seen its economy shrink since 2007, but three per cent growth is projected for this year. “The manufacturing and construction downturns in the (Hamilton) CMA appears to have hit bottom — in fact, manufacturing output is expected to grow for the first time in eight years,” it said. Windsor has taken some of the hardest knocks of any city in the country in the past few years, yet the news is also good there. “Windsor’s economy can expect to grow for the first time in four years. An improved auto outlook and a combination of higher housing starts and non-residential projects will lead to growth of 2.6 per cent in 2010,” it said. London should see 2.5 per cent growth, but that won’t be enough to offset its job losses of 2009. St. Catharines-Niagara is expected to post the first growth in manufacturing output in a decade, and its housing market should recover from a five-year slide. This should lead to 2.4 per cent growth. Sudbury should see 2.6 per cent growth, but that is put in doubt by the continuing strike at Vale Inco. Thunder Bay has seen its economy decline for the last four consecutive years. Its economy is only expected to grow by 0.8 per cent. “Although the ‘old’ economy (particularly forestry) continues to struggle, diversification into medical technologies is expected to start paying off,” it said. Ottawa-Gatineau is expected to grow by 3.2 per cent while Kingston should grow 2.5 per cent. 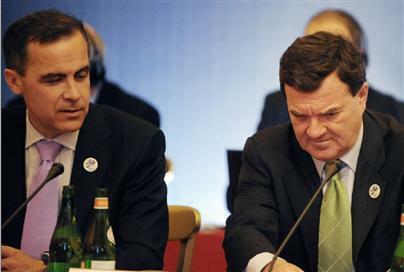 The public sector in both places helped those cities dodge the worst of the recession, it said. Seven medical doctors top the list of inductees into this year’s Order of Ontario, including the wife of a freshly minted cabinet minister. sworn in as Ontario’s minister of citizenship and immigration. Six other medical doctors besides Nutt were also inducted this year. They are: Philip Berger, an expert in urban medicine, addiction and homelessness; cancer specialist Helen Chan; Kellie Leitch, a pediatric orthopedic surgeon; James Orbinski, a founder of Doctors Without Borders; diabetes researcher Mladen Vranic; and Anne-Marie Zajdlik, a family physician and AIDS activist. In a letter thanking Lt.-Gov. David Onley for adding her name to the prestigious list of winners, Leitch wrote of one of her patients, Emma Healy. along with my colleagues, in developing the Paediatric Surgery Department at the Children’s Hospital of Western Ontario,” Leitch wrote. Sports and media mogul Paul Godfrey, broadcaster Ken Shaw and Levente Diosady, whose work with food process engineering has helped to remedy iodine deficiency around the world, were also honoured. Godfrey, recently picked by Premier Dalton McGuinty to chair the Ontario Lotteries and Gaming Corporation, is president of the National Post, a former Toronto Sun executive and president of the Toronto Blue Jays. He was also once chairman of the now-defunct Metropolitan Toronto. Former Scotiabank president Peter Godsoe and businessman Lawrence Bloomberg made the list for philanthropy, while writer Jacques Flamand, arts patron Shirley Thomson and actor and director Diana Mady Kelly made it for contributions to the arts. The order was created in 1986 to recognize the highest levels of achievement in any field. Onley will invest the new members of the order on Thursday. OTTAWA-Twenty-four Haitian orphans stepped off an Air Canada A330 on Sunday into frigid cold to begin new lives in Canada. 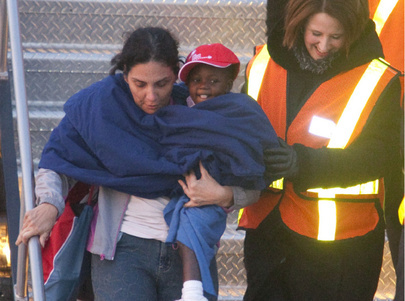 The children, ages 9 months to 11 years, were wrapped in blankets and whisked into the Canada Reception Centre. They are the first wave of some 180 expected to be approved for adoption by Canadian families. As the children, some walking and others carried, disembarked expectant parents peered out the window to get a glimpse of their newest family members. The children were given stuffed toys and Red Cross blankets. “This is just to make them feel a little bit better when they get off the plane. Many of them left Haiti with nothing,” said Alison Frehlich, a Canadian Red Cross spokeswoman. There were 86 people on board the special flight. Besides the orphans, the passengers were Haitian-Canadians evacuated from the earthquake ravaged country. The new and repatriated Canadians were given the chance to pick out winter jackets provided by the Salvation Army. Jean Robert Vaval of Montreal added to his already large family by adopting 14-year-old Jordan Noel. “With my wife and the kids we are going to be nine,” he said. Vaval runs a creole restaurant in Montreal and invited the media for a meal. “It’s a happy day,” he said, beaming. The good news in Canada came amid more bad news in Haiti. The confirmed death toll from the quake has topped 150,000 in the Port-au-Prince metropolitan area alone, the country’s communications minister said Sunday. Communications minister Marie-Laurence Jocelyn Lassegue told said that the figure is based on a body count in the capital and outlying areas by CNE, a state company that has been collecting corpses and burying them in a mass grave north of Port-au-Prince. It does not include other affected cities such as Jacmel, where thousands are believed dead, nor does it account for bodies burned by relatives. 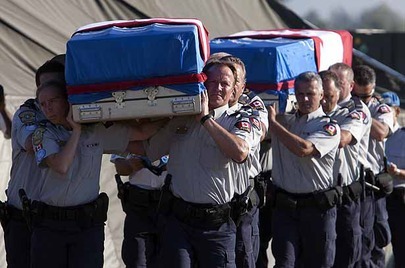 At a news conference in Ottawa, Foreign Affairs Minister Lawrence Cannon said that since the Haitian government has officially declared that the search and rescue phase over, the focus has turned to repatriation of the remains of Canadian victims. “We are working as quickly as possible through a number of complex logistical issues … related to identification and proper documentation of individuals,” Cannon said. He said the number of Canadian fatalities had risen by one to 19 and added that 213 Canadians are still missing. Some 2,327 individuals have been evacuated and another 60 are waiting for flights home, he said. Cannon and Prime Minister Stephen Harper were due to meet with Haitian Prime Minister Jean-Max Bellerive in Ottawa on Sunday afternoon. Their meeting comes in advance of a meeting of international diplomats Monday in Montreal to sketch out the early plan for the rebuilding of Haiti. “We need to arrive at a common understanding and commitment on certain basic principles of responsibility, accountability and long term engagement,” Cannon said. “We need to identify with the Haitian government key priorities in order to define a road map of the tasks ahead,” Cannon said. “In time we will put the population to work so that we can be independent (of aid) because the Haitian population is a proud population that is used to working,” he said in Haiti, before boarding a flight to Ottawa. He said the government was working as fast as possible to reopen the factories and create employment in the aftermath of the quake. “We have received great help. We have fallen to the ground but we will get up again. We’re not dead. We’re going to get up and rebuild another Haiti,” Bellerive said. OTTAWA – Immigration Minister Jason Kenney announced Friday that Haitian authorities had given approval for Canadians to adopt Haitian children and that the first 86 children could be brought to Canada by plane as early as this weekend. “Those will be the first children to arrive here in Canada,” Kenney told the media. An aide to the minister said it is not known yet which Canadian airport will be the site of the arrival. Kenney said Ottawa is aware of another 68 applications from Canadians to adopt Haitian children. The government in Port-au-Prince has authorized the adoption and departure to Canada of these 68 children as well but the applications are in an earlier stage in the approval process in Canada. The federal government has asked provincial authorities to move quickly to complete their certification of the would-be parents so these children can also be brought here quickly, Kenney said. Canada and other nations helping earthquake-battered Haiti face nothing less than the “rescue of a shattered society,” Prime Minister Stephen Harper said. “Canadians have been profoundly moved by the suffering of their fellow human beings in Haiti. Canadians have asked us to do everything in our power to help,” he told members of the Conservative caucus Friday morning. Hours before Harper spoke, a ramp ceremony was held at the airport in Port-au-Prince, Haiti, for Sgt. Mark Gallagher and Supt. Doug Coates. They were among the 16 Canadians confirmed killed in the quake, in which some 200,000 people are estimated to have died. Gallagher was remembered as a policeman with a common touch, while senior UN officials paid tribute to Coates’s humility and professionalism. More than 200 people attended the ceremony, including Canadian and Jamaican soldiers and Chinese police officers. The bodies are expected to arrive later today at CFB Trenton, east of Toronto — the same base where the remains of Canadian soldiers killed in Afghanistan are repatriated. Harper said Canada’s response to the disaster has been “unprecedented,” led by the armed forces, diplomats and aid workers. “The even larger task in the months and years that will follow is to rebuild Haiti to transform its unimaginable grief into a sustained hope for the future,” he said. Three hundred and six Canadians remain unaccounted for as rescue efforts continue to probe collapsed buildings, and 1,892. More than 1,700 Canadians have been evacuated from the island nation. Ottawa estimates there were more than 6,000 Canadians in Haiti when the magnitude-7.3 earthquake struck on Jan. 12. Canada has committed some 2,000 soldiers to the relief efforts, including two ships, helicopters and a disaster assistance team. Nearly 1,000 Canadian soldiers, sailors and aircrew are already on the ground or off the coast of Haiti. More than 20 Canadian institutions will be promoting Canadian education on Jan 23-24 in Kuala Lumpur, Jan 26 here and Jan 26 in Kuching. Programmes such as engineering, business, actuarial science, biotechnology, computer science and pre-university courses will be showcased. Representatives from these institutions will be on hand to counsel interested individuals on admission requirements for this year’s September intake. The Department of Citizenship and Immigration Canada will also be part of the fair to provide information on student visa applications for Canada. Eligible foreign students at public post-secondary institutions can also gain work experience through off-campus employment during school year and study breaks. It will be held at Hyatt Regency Kota Kinabalu from 2pm to 7pm on Jan 26.